Following the death of Constantius II in 360 AD, the empire fell into the hands of the last heir of Constantine The Great – Julian II (360-363 AD) . Julian also instituted economic and governmental reforms as well as religious reforms due to his anti-Christain or pegan beliefs. He almost immediately tightened finances in an effort to curb inflation. Bureaucratic reforms were also instituted and aid to the provinces was shifted in favor of those regions where he enjoyed the strongest support – mostly in the East. Julian II attempted his own monetary reform of the bronze coinage. He introduced a restored follis with a very large flan of 30 mm at a weight of 8 to 12 grams and was silver washed (plated). It is most likely that this new denomination was equivilent to 4 or perhaps 3 of the AE3 reduced follis, which superceeded the”centenionalis” during the post 354 AD period under Constantius II. This reform of the bronze coinage successfully lasted for several decades into the reign of Theodosius I (379-395 AD) before being discontinued. 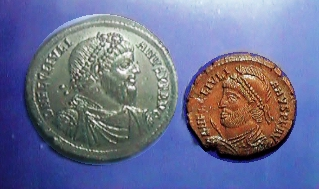 During the reign of Valentinian I (364-375 AD), another denomination was added to the bronze coinage typically classified as AE2. This denomination was most likely equivilent to half-restored follis. The weight of this denomination appears to vary between 4 and 5.5 grams. There were many reforms that Valentinian I brought to government, most of which focused perhaps too much on the military. Soldiers were given almost special status and taxes were raised by almost any means possible to insure revenue. Less refined military men were raised to the rank of Senator and the Senate itself complained about the diminishing role, which it played within government. With the numerous changes in administration and a growing contemporary counterfeit output, the money supply of the Roman Empire was slipping into distrust and chaos. The best illustration of this trend is none other than taxation. The tax collection under Valentinian I took a step back in time when the government of Rome refused to accept its own coinage in payment. During the tax collection of 366-367 AD, taxes due the government were not accepted in coin at all, but instead by weight and metal content. Everything was melted down and poured into ingots such as the one illustrated here. The inscription on this ingot reads “melted by Proculus” weighing in at 211.8 grms measuring 91 x 16 x 9 mm. This bar represented 47 gold solidii at a weight of 4.5 grms each. Valentinian I had also raised his brother Valens (364-378 AD) to the rank of co-emperor. In 367 AD, Valentinian’s eldest son Gratian was also raised to the rank of co-emperor. Upon Valentian’s death in 375 AD, the empire was ruled by Valens and Gratian. Valentinian II (375-392 AD), younger brother of Gratian was also raised to the rank of co-emperor despite being a mere boy. We can see that weight relationships follow the traditions of Roman coinage being issued on a division of 2 such as was the case for the silver coinage from the Miliarense, Siliqua and Half-Siliqua. Hoard evidence suggests that the AE3 was by far the most common bronze denomination. This reform of Gratian prevailed for the most part until the bronze reform of Theodosius I. However, following his death, while the denominations remained constant, the weights were reduced to AE4 1.13 sometime between 383-386 AD. In 378 AD, the joint-emperor of the East, Valens, met his death at the battle of Hadrianopolis at the hand of the Goths. Gratian had little choice but to turn to a famous general Theodosius I (379-395 AD) who was thus elevated to the vacant Eastern throne in January, 379 AD, about five months after the death of the Emperor Valens. It was Theodosius I who introduced a new denomination in gold equivalent to 1/3rd solidus known as the”tremissis” with an average weight of 1.51 grams, which replaced the 1½ scripulum (3/8th solidus). This denomination appears first in the Eastern regions of the Empire between 379 and 382 AD. The Gothic invasions appears to have had a fairly major impact upon the monetary system of the Roman Empire at this period in time. In addition to the tremissis, the bronze coinage appears to disappear leaving for the most part only the tiny AE4 quarter-centenionalis. We do see some periodic issues of AE2 and AE3 denominations, but the large AE1 double-centenionalis was not issued again until the monetary reform of 475 AD under the emperor Zeno (474-491 AD). The introduction of smaller gold coinage and the disappearance and/or reduction in bronze coinage output, reflects the scarcity of money following the Gothic invasions. The barbarian invasions of the late 4th century AD led to greater political instability within the Western half of the Roman Empire – modern day Europe. Usurper Magnus Maximus appeared in Britain during 383 AD and defeated Gratian. Eventually, Theodosius was forced to march against him and his son Flavius Victor and defeated the pretenders in 388 AD. But the death of Gratian clearly marked the final decline of the Roman Empire in Europe. Following the likely murder of Valentinian II in 392 AD by the Frankish general Arbogastes, the defactoruler in Gaul at this time and caretaker of Valentinian II, another usurper appeared in the West. Arbogastes made a bid for independent power by proclaiming Eugenius (392-394 AD) as Emperor in the West on August 22nd, 392 AD, since his own barbarian descent barred him from imperial office. In the spring of 393 AD, Eugenius and Arbogastes invaded Italy. Theodosius I decided to take immediate retaliatory action and marched to the West invading Italy and defeating his rivals at the battle of the Frigidus. Eugenius was executed and Arbogastes committed suicide rather than face the wrath of his former master.